Before going into the post , the cute bag which i kept the murukku was gifted to my by a sweet reader of mine. Thank you so much Aarti. Powder the roasted gram into a fine powder. No need to roast it. Combine the rice flour, gram flour and the roasted gram flour in a wide bowl and add the cumin seeds and asafoetida and salt. Melt the ghee or butter and add this to the flour. Mix nicely and evenly. Add water little by little and knead it into a pliable dough. Use the single star achu and put a portion of dough in the mould. Start pressing the murruku in hot oil. Take this out from the oil and drain in a kitchen towel. Always ensure that the oil is hot. You can enjoy this as an tea time snack. Butter murukku is ready. This can be stored in airtight containers for a week to 10 days. if making in bulk knead the dough in batches, else it will turn red while frying. love the cute bag!! 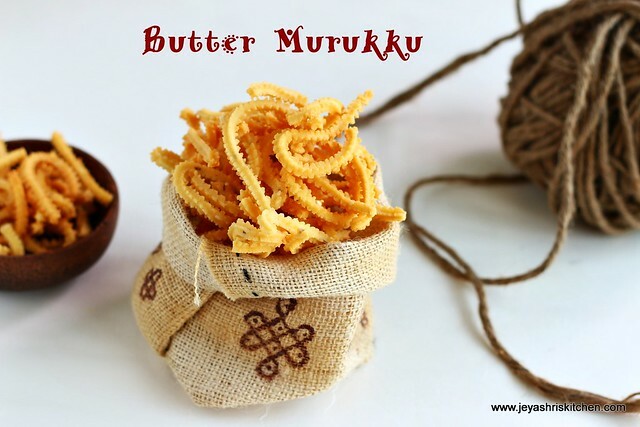 very nice and very traditional and festive.. and this murukku is simple and delicious!! is it raw rice or boiled rice? can we get the readily available flour frm stores? 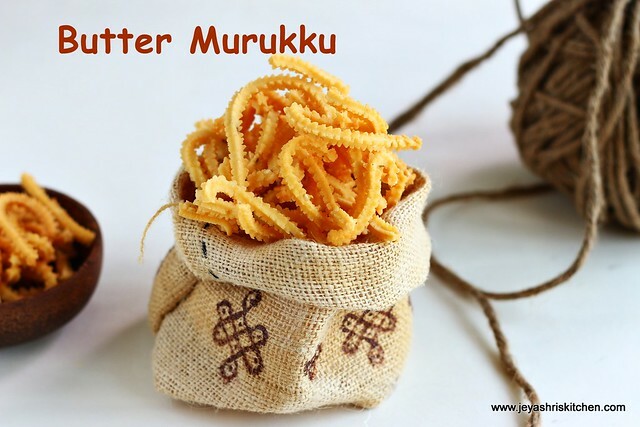 Crunchy and munchy murukkus and that bag looks so so beautiful.. Excellent and delicious to look at murukkus. Very attractive bag, i want that bag and those crispy murukkus with. Very nice recipe and so well explained as always. Love the murukku and the presentation. That cute jute bag is a show stopper. 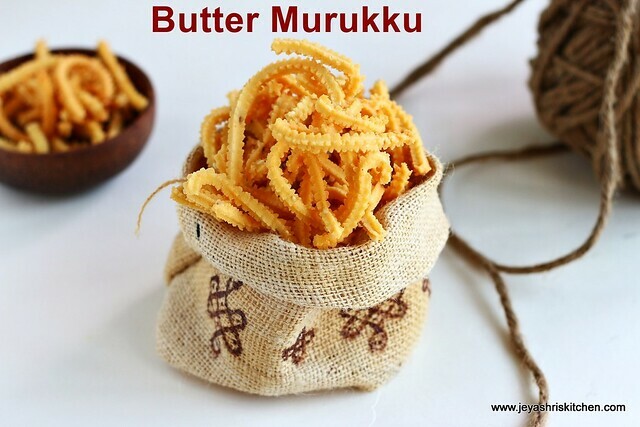 Did I miss something or the butter murukku does not actually have butter in it? Murukku looks super...and the pics really compliment it! I tried it and was big hit at home! Thanks jeyashri for this ready easy recipe! !